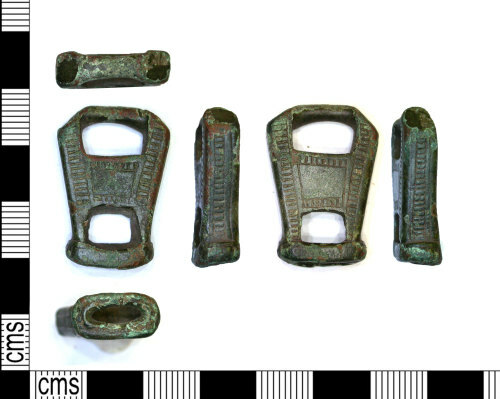 Medieval copper alloy mount. Length: 30 mm, width: 20 mm, thickness: 6 mm, weight: 16.89 grams. The object is rectangular in form and section and appears complete. Its base (as shown) is hollow and has a rounded collar at its edge. Above this the object has slightly outwards tapering edges and is largely solid. It has two rectangular holes, one above the collar creating a void above the hole in the base. The second larger one sits in the upper third of the object and is separated by a rectangular central section. This central area is decorated with an upper and lower border of a ladder like incised pattern. The sides are decorated all the way up with the same ladder pattern which is bordered by a solid incised line. This ladder pattern is repeated along the edges of the object from the collar to the upper corner. The upper edge of the object is plain and formed of a sub circular horizontal shaft above the larger hole which runs into angled, 'cut away' corners. This shaft has clear signs of wear caused by another object rubbing against it. In form the object is reminiscent of a swivel mount component such as HAMP-A65BE2 and HAMP-A65BE2 but its form and decoration are different.